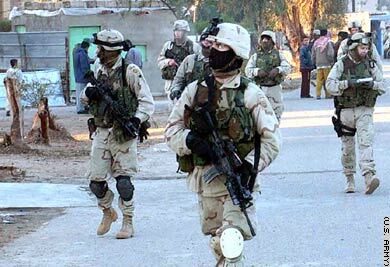 Paratroopers assigned to the 82nd Airborne Division's Company B, 1st Battalion, 505th Parachute Infantry Regiment, conduct a dismounted patrol in Fallujah, Iraq, in January 2004. Units: The division's 325th Airborne Infantry Regiment, a quick-reaction brigade combat team that has more than 4,000 soldiers, was ordered to deploy on January 12, 2003. Also ordered to deploy were 18th Airborne Corps support elements consisting of the 35th Signal Brigade and 525th Military Intelligence Brigade. Another 82nd Airborne brigade is in Afghanistan while a third brigade is at Fort Bragg, as one brigade is kept ready for airlift worldwide within 18 hours of being ordered to deploy. The division's signal and military intelligence units returned to Fort Bragg in May 2003 and the 325th Airborne Infantry Regiment began returning on January 19, 2004. The entire regiment should home by February 2004. In September 2003, the division's 505th Parachute Infantry Regiment and elements from the division's Headquarters and Headquarters Company deployed to Iraq for six months to relieve the 3rd Infantry Division. Duties: The 325th and 505th Infantry Regiments, along with the 3rd Armored Cavalry Regiment, currently patrol and provide security for western Iraq, including the Iraqi border with Jordan and part of the border with Syria. The division's traditional role is speedy insertion -- either by parachute or by helicopter -- of soldiers on or near a battlefield. During major combat in Iraq, the 325th Airborne Infantry Regiment protected supply lines, eliminated resistance bypassed by the main attacking units and launched a successful April 3 assault on Iraqi paramilitary forces attempting to organize north of the southern city of Samawa.